Syria's war has seen several major territorial changes in the past month, with a Turkish military intervention bringing IS defeats even as the rival, Kurdish-led Syrian Democratic Forces have captured key territory from both IS and the Assad government. Meanwhile, the government has scored some major victories of its own against rebel forces. See all this and more on the latest update to PolGeoNow's concise, professional Syrian Civil War control map, which includes a timeline of changes since our previous Syria map report in late July, with sources cited. 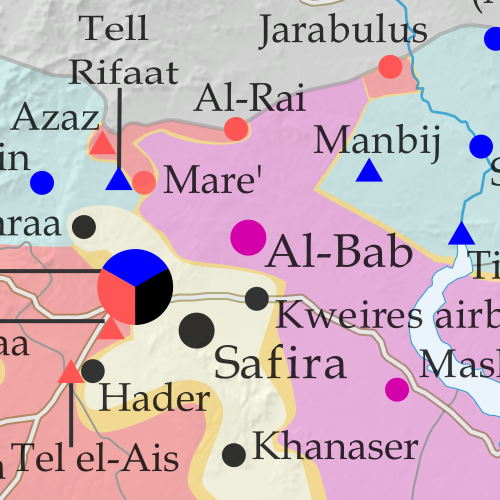 Up-to-date map of current territorial control in Syria, color-coded for the Assad government, rebel groups, "Islamic State" (ISIS/ISIL) fighters, and Kurdish/SDF forces. Color blind accessible. 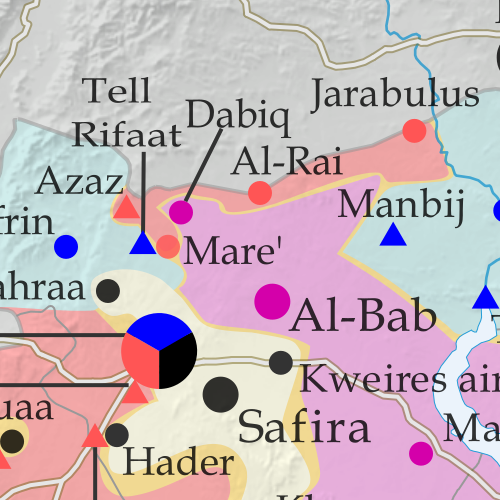 Special symbols indicating towns dominated by rebels of the Nusra Front (now Jabhat Fateh al-Sham) and US-backed Syrian Democratic Forces (SDF). Locations of recent fighting and military operations, including Jarabulus, Manbij, Daraya, Hasakah, and more. Detailed timeline of important events and changes to territorial control since July 25, 2016, compiled by our Syria-Iraq expert, with links to sources. This is a brief supplement to our Mar. 4 report, Ukraine Map: Occupations, Autonomy, & Invasion. See that report for a detailed overview of protester occupations and declarations of autonomy in the first two stages of the Ukraine crisis: the anti-Yanukovich Maidan movement and the eastern pro-Russian protests. 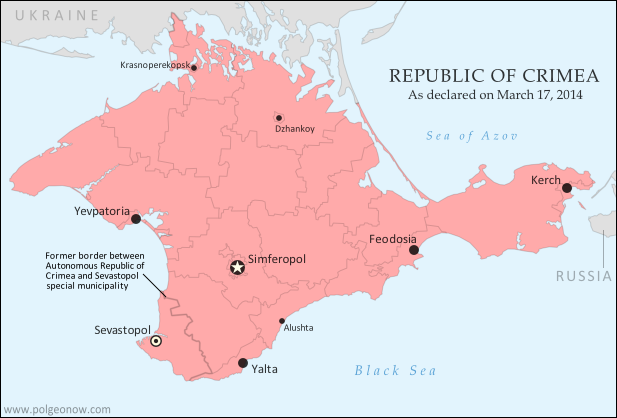 The current article is an update on the current control situation in Ukraine from Mar. 4 to the present. This map and article are exclusive premium content, available only to members or for individual purchase. Buy now (US$5.99). PolGeoNow begins our Ukraine coverage with this overview of the political situation from January to the present, both before and after the overthrow of President Viktor Yanukovich's government. Details shown include protester occupations, declarations of autonomy, and Russian invasion. This map and article are exclusive premium content, available only to members and for individual purchase. Buy now (US$5.99).